Somehow I managed to miss Mike Toulouzas’ Illusion when it was first offered. My mate Chris had picked up a copy and brought it around to one of our show-and-tells - it was clearly a gorgeous puzzle … and he couldn’t say enough good things about it puzzle-wise … so when Mike got in touch at the tail end of last year and offered me a copy, I didn’t give him any time to change his mind or offer it to anyone else. It duly arrived in Barnt Green during a period of enforced puzzle-hostage-taking as Gill’s got wise to my puzzle-buying around Christmas and now routinely hijacks any parcels addressed to me during December and puts them under the Christmas tree … so shortly after Christmas I got to unwrap this beauty from Greece. Illusion looks a bit like a complicated 12-piece burr with some extra detailing around the centre that makes it look like the burr is projecting out of a cube in the middle. Look a little closer and you’ll spot a few diagonal cuts on the burr pieces and that’s enough to help you realise that this little puzzle is not at all what it first appears to be … and knowing that Mike is a master at odd angles, you’ll realise that this puzzle quickly earns, and definitely requires, huge amounts of respect. 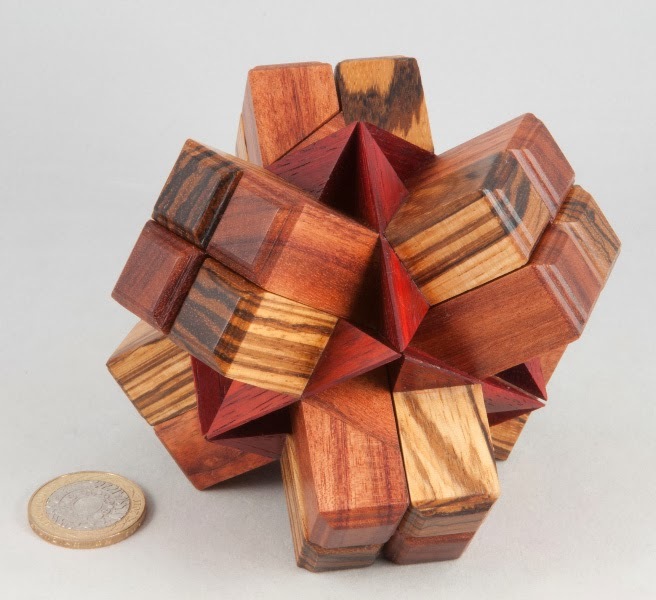 A bit of a casual fiddle around with this puzzle and you find it’s not going to come apart the way you might have expected … find the right axis and it’ll slide apart neatly, and then, unless you’re handling it rather carefully, it will dismantle itself into six rather oddly shaped pieces … each of which is unique! 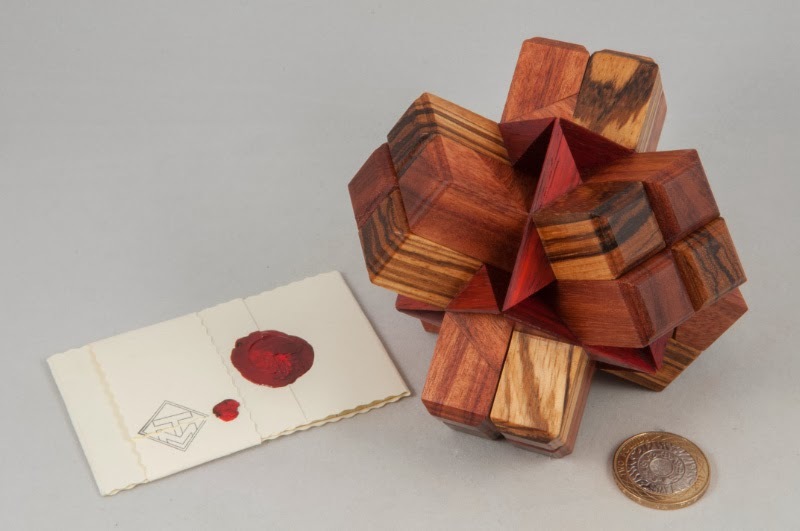 It’s pretty easy to get the general idea of how the puzzle is going to go back together again – each of the six pieces has four of the sticks and some elements of the central cube structure, and combing them builds up the cube in the middle … sort of … because there are a bunch of protuberances on each piece which need to have corresponding gaps in their adjacent pieces … which on their own would make for a pretty reasonable challenge … HOWEVER you’ll then find there are multiple assemblies – virtually all of which cannot be solved! I’ve spent ages with five pieces locked together perfectly, with spaces in exactly the right place for the final piece to be slotted in, but no way of actually getting that last piece into the assembly because the sliding axis that I need to have has somehow been blocked somewhere by a well-fitting, albeit misplaced, piece. Then onto another five-piece assembly that stubbornly refuses to admit the final piece even though it’s the perfect shape … until eventually a five-piece assembly arrives with a sliding axis to remove two pieces, add the final piece and slide the two halves together … puzzle-bliss. Mike’s taken a well-known puzzle, added several unique Toulouzas touches to it and turned it into an absolute beast! A drop-dead gorgeous beast, but a beast nonetheless! 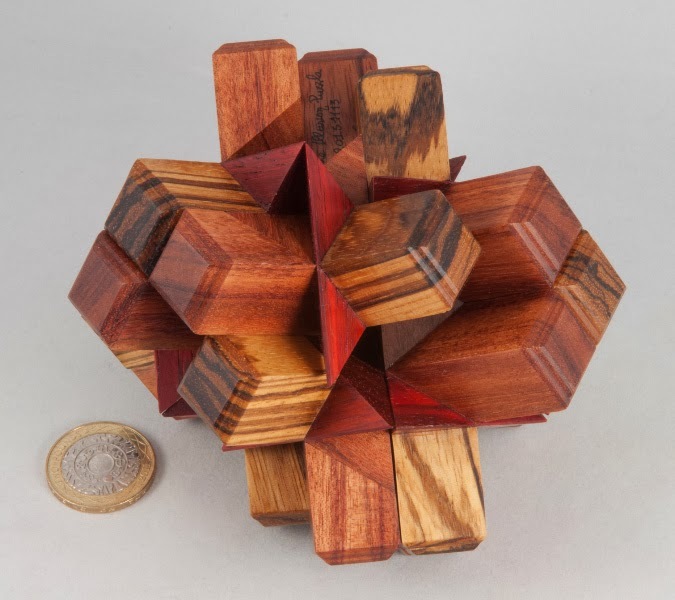 The craftsmanship in there is staggering – each of the six pieces is made up of around 10 individual oddly-shaped bits – glued together supremely accurately with the result that the illusion of twelve sticks piercing a cube is almost perfect. Bravo Mike! That is an awesome achievement and a terrific puzzle! Thanks. OK – if you’ve been reading my blog for any length of time you will have noticed that I’m an unabashed Stickman fan-boy … heck, even Gill’s a huge fan of Rob’s work, and that’s saying something! So when Nick Baxter’s auction machine swung into action again recently, and it had a few Stickman boxes on it, I paid attention. 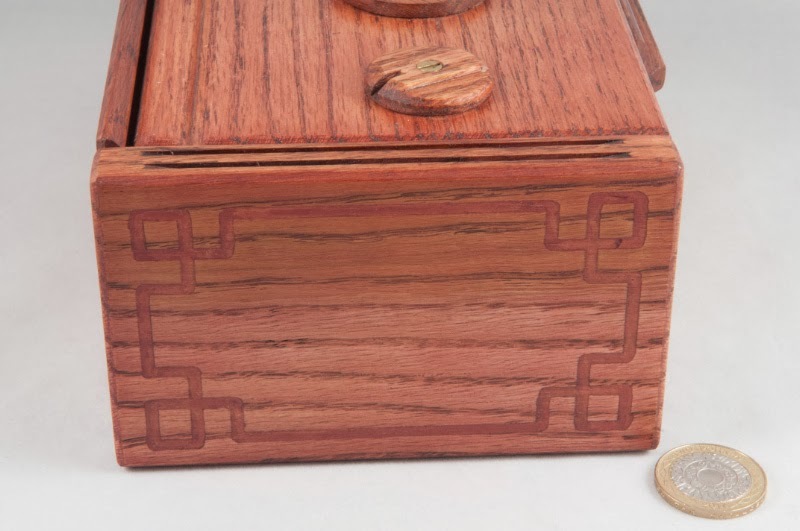 While I didn’t manage to get most of the things I was trying to acquire, I was successful on one of them, and a rather well-looked-after Stickman Holiday Lockbox arrived in Barnt Green a couple of weeks later. 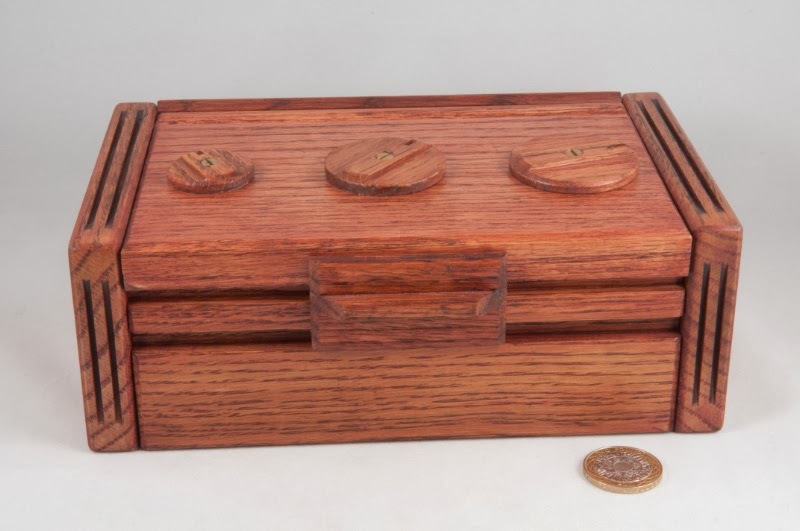 The three dials on the top of the box are used to represent a date and can be set to any date the owner prefers. Opening the box is a simple matter of using a paper template that fits over the dials to set a month (first, smaller dial on the left – it’s American, remember), day and year, and once you’ve set that properly, the slider will move and the lid can be opened. 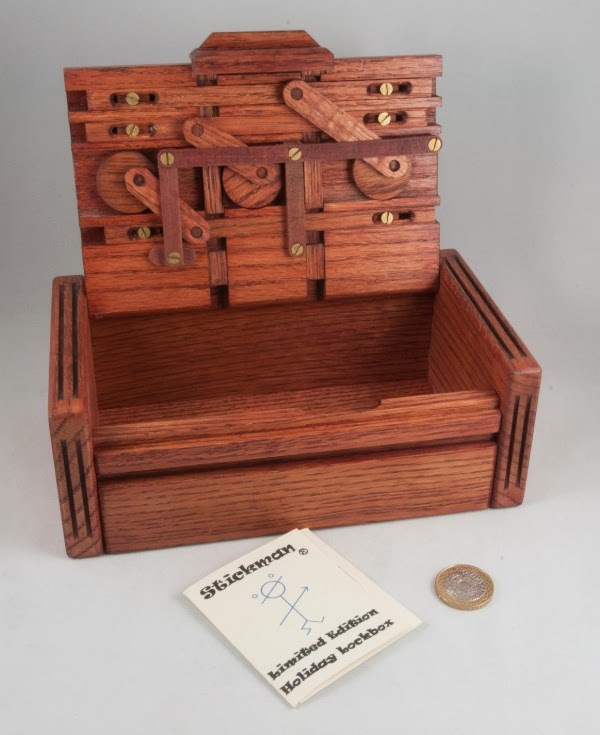 Rob’s rather clever design for the mechanism uses three discs to drive a set of sliders left and right – when they’re in the proper position, they allow the locking slider to move out of the way to enable the lid to be opened. The designs allows two interesting things – firstly, the dials on the top can effectively spin freely, never coming up against a stop and secondly, the left/right sliders can be loosened allowing the owner to set a unique date as the unlock code … cool. 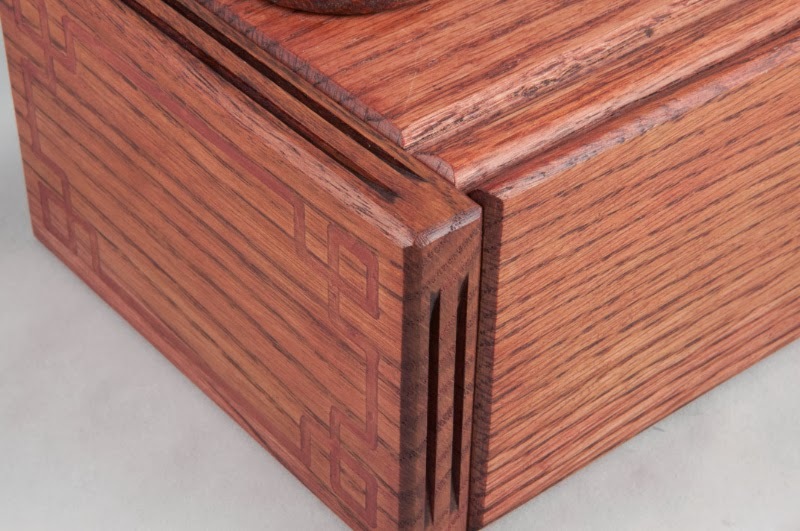 Havanas Box #3 - "Mike"